As Thanksgiving dawned once again, I was beset by nervous tension. Why? It’s just another day, right? Not to my mind. To my mind, holidays require extra oomph. Preparing a special meal, even a fairly simple one, zaps my energy. Interacting with people for a good part of the day, even people I know and love, zaps my energy. As an introvert, my energy reserves are already limited. Even more so after a night of poor sleeping, kept awake by a mind that won’t allow my body to let go. So, with Thanksgiving upon me, and maybe a spoonful of energy available for the entire day, I knew I was in trouble. I needed to build my reserves. I needed to pull my brain from its anxious mode of thinking before it drained whatever remained in that spoonful, and open my heart to all that is right in the world. And what better way than to give myself a healthy dose of gratitude practice. 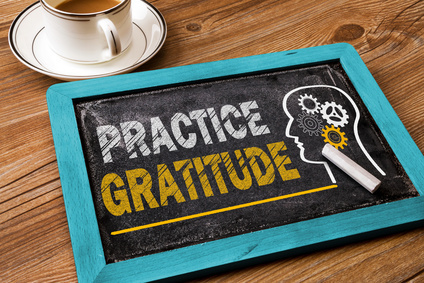 Here’s how it works: ponder, talk about, or write down the things you are grateful for. As you do, your energy shifts, your vibrations rise, your perspective broadens. Even a teensy bit is a step up the emotional ladder. 1. I’m grateful to have a brain that holds my memories, a brain that allows me to create and imagine and discover and understand and make sense of life, even though that brain doesn’t always work well. Sometimes the circuitry gets stuck in anxietyville. Sometimes the messages it sends are lies. Still, for the most part, it’s a brain that I am grateful to have. 2. I’m grateful to have a body that holds my spirit, even though that body complains at times, gets achy and painful and inflamed and shoots out much too much adrenaline and cortisol. Still, it carries me from point A to B, and allows me to see the sunset and hear the patter of rain on my roof and taste chocolate truffles, the dark ones from See’s, and smell the lavender bushes as I walk the neighborhood. It allows me to hug and cuddle and dance and hike and swim, and defend myself if need be. 3. I’m grateful to have a cottage that houses my body, even if that cottage is the dimensions of an over-sized closet. Still, it’s bigger than a cardboard box, and it’s not under a freeway overpass, and I have my own bathroom. 4. I’m grateful to live in America, a country where people who own playhouses the size of over-sized closets can rent them out at exorbitant fees, even though that country has a government that is sometimes populated by clowns. Still, it’s a government that ensures my food is safe to eat, the air is safe to breathe, and the water is safe to drink. It provides aid if I need it, and will rescue me if I’m taken hostage somewhere. Or at least attempt to rescue me. And I’m grateful to live in a country that accepts immigrants because I came from immigrants, we all did, unless we happen to be of Native-American ancestry and really, the only people who have the right to complain about immigrants are the Native-Americans, and why shouldn’t they, since it was immigrants who brought disease and wiped out their buffalo population and stole their land and turned it into high-rises and freeways, and truth be told, if my immigrant ancestors had been walled out by the native tribes, I wouldn’t be living here now, in an overpriced closet, shooting out adrenaline and cortisol. And I’m grateful to have the right to say any of this without being jailed or tortured or put to death. 5. I’m grateful to you, my reader. It’s you who make all this outpouring of words worthwhile. It’s you who keep me going when showing up at the keyboard seems like a monumental task. It’s you who make the process of writing complete, who answers the question: if a writer writes and no one reads what is written, do the words matter? They do. Because when I write with you in mind, I learn something about what it means to live on this big crazy revolving ball of energy. Your brain space seems remarkably similar to mine on a regular basis… So I’ll add the other thing I’m grateful for: A weekend to recover from the stresses of participating in a holiday about being thankful. Good one! I agree. I “opted out” of Black Friday and hit the trails with my hiking boots on. Aww, thank, Bun! Ditto. Love your blog too. Awwww…I’m thankful for you too Diane! I thought about you and wondered how you were spending the day cuz I know it’s not the easiest for you. Love you! Thanks Joan! Hope you had a super Thanksgiving. This is a lovely post, thank you for writing it. I am thankful for thebloggess.com she leads me to fun places sometimes. The Bloggess is definitely someone to be grateful for. Her perspective on anxiety and depression are much-needed in this world. Thanks for stopping by, Jenny! Hope to see you ’round the doohickey again.